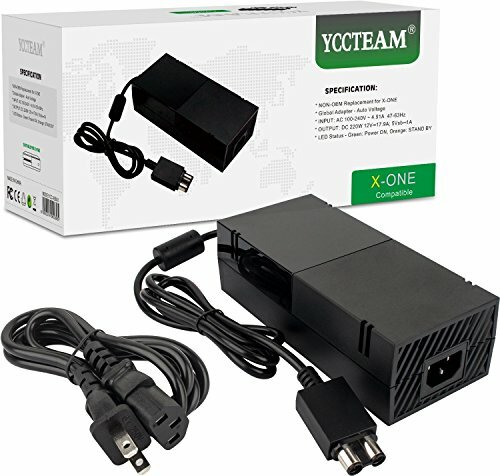 The Xbox One AC Adapter replaces any lost or broken AC power adapter for the Xbox One systems. The AC Adapter has a LED indicator light to display the power status of the Xbox One system. Please Note:We have made great improvements on the fan, the lasting life of this xbox one ac adapter, please rest assure to buy. Technical Note:When the Xbox One turned off,and the fan keeps run and make a bit noise, Go to settings>power and startup>power mode and startup. Change your power mode to energy saving and that should solve your problem! SAFETY - Made of ABS contained material which can prevent burning.This power brick has over-charge, over-heat, over-discharge ,over-current,short circuit protect. Warranty--One year warranty and 30 days money-back guarantee with confidence.If you have any concerns or questions about The xbox one power brick.Please feel free to contact us. If you have any questions about this product by Yteam, contact us by completing and submitting the form below. If you are looking for a specif part number, please include it with your message.